NFL teams will be fined if players kneel for the US national anthem under a new policy. The American football league said players who do not stand for the Star-Spangled Banner can stay in the locker room until it has been performed. The NFL also vowed to “impose appropriate discipline on league personnel who do not stand and show respect for the flag and the Anthem”. Players said the protests were against police brutality of African Americans. “It was unfortunate that on-field protests created a false perception among many that thousands of NFL players were unpatriotic,” said NFL Commissioner Roger Goodell in a statement accompanying Wednesday’s new policy. NFL players were previously required to be on the field for the anthem, but there was no firm directive to stand during the song. The policy includes the provision that clubs can develop their own rules – so long as they abide by the league’s directive – to handle players who do not wish to stand. It does not state how much clubs will be fined should their athletes protest on the field, but gives them the option to impose penalties on any player who breaks the new rules. The statement comes a day after NFL teams pledged $90m (£67m) towards social justice initiatives, under an agreement reached with all 32 teams in the league. President Donald Trump was highly critical of the protests, calling them “disgraceful” and unpatriotic. He also urged the players to be fired. US Vice-President Mike Pence walked out of an NFL game because players from Mr Kaepernick’s team knelt during the anthem. Donald Trump started a staring contest with the NFL, and the NFL just blinked. What began as a few unscripted presidential comments at an Alabama campaign rally escalated into a public relations nightmare for America’s most popular sports league, which saw its patriotism questioned from the White House bully pulpit. 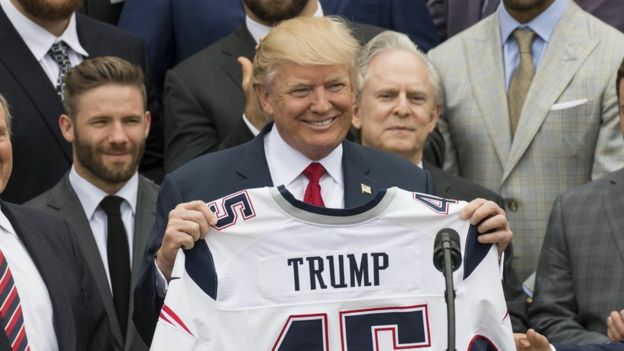 Within a matter of weeks the NFL’s popularity plummeted among conservatives and its financial bottom line was threatened – stark proof that Mr Trump can drive the opinions of his supporters even when his target is a national juggernaut that has spent years branding itself as a shared American cultural experience. Now protesting athletes, who always insisted they were kneeling to draw attention to the abused and ignored victims in American society, will have to save their demonstrations for the solitude of the pre-game locker room. On the field, expressed love of anthem and flag will be mandatory. The NFL Players Association (NFLPA) issued a statement following the policy announcement saying they were not consulted. “NFL players have shown their patriotism through their social activism, their community service, in support of our military and law enforcement and yes, through their protests to raise awareness about the issues they care about,” the statement reads. The NFLPA also said it will be reviewing the policy and will challenge aspects that are inconsistent with the agreement in place between the league and the union. Jed York, owner of the San Francisco 49ers team, abstained from voting on the new policy. “I think there are a lot of reasons, and I’m not going to get into all of those reasons,” Mr York told reporters, according to ESPN. New York Jets CEO and chairman Christopher Johnson said he prefers that players stand for the national anthem but will not make them pay any fines. Mr Johnson told Newsday: “I never want to put restrictions on the speech of our players”. He said the Jets would pay any fines associated with kneeling during the anthem and he would work with players on social justice issues.